Mobile ad network AdMob (now part of Google) released its final Mobile Metrics report today (embedded below), at least for a while. AdMob gathers data from millions of phones and mobile devices which serve up its ad impressions, including almost 44 million iOS devices (iPhones, iPod Touches, and iPads). The decision to stop disclosing the data may have something to do with its new owner, Google, wanting to assess what it wants to let out there, but it could also be tied to the fact that AdMob might no longer have access to any iPhone data since Apple is specifically threatening to block it. Whatever the reason, AdMob’s reports have proven to be a rich source of data on the mobile Web across platforms since mobile ad impressions on the mobile Web and in mobile apps are a decent proxy for mobile Web/app usage overall. So let’s dig in. Over the past two years, mobile ad impressions from smartphones have grown from 22 percent of the total to 46 percent in May, 2010. 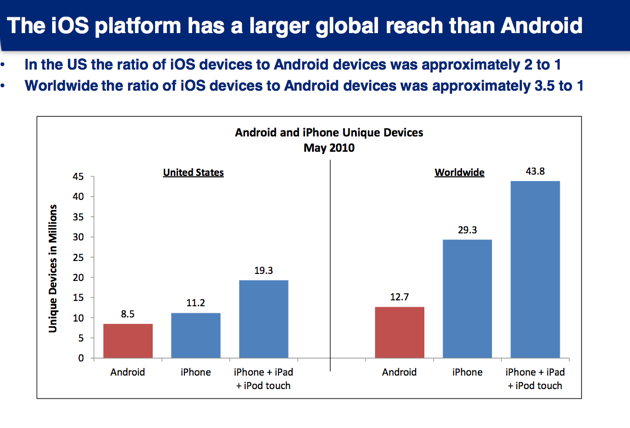 Apple iOS devices account for the largest portion worldwide, with 40 percent share. But as you can see in the chart above, that share has been declining since it peaked above 50 percent in November, 2009. 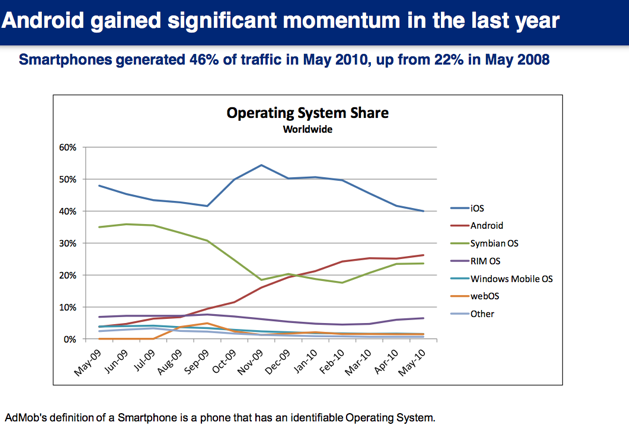 Over that time, Android has been steadily taking share, rising to 26 percent. The ratio of handset market share to mobile Web and app usage is not directly correlated. 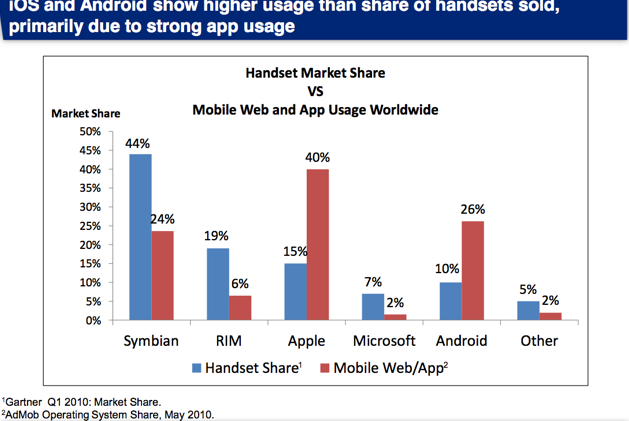 Nokia’s Symbian has a 44 percent share of handsets worldwide, but only 24 percent of of mobile Web/app usage. In contrast, Apple only has 15 percent handset market share, and Android has 10 percent, but together they account for two thirds of mobile Web and app usage. On a worldwide basis, Apple devices still outnumber Android in terms of mobile ad impressions by a factor of almost 3.5 to 1. In the U.S., that ratio is about 2 to 1. According to an AdMob survey, iPhone users are more satisfied (91 percent) than Android (84 percent) or Palm’s WebOS users (69 percent). Android’s 84 percent satisfaction is pretty good, but there is still a gap with the iPhone. While the iPhone is the single biggest device driving mobile ad impressions, Android phones account for 7 of the top 10 handsets (the other two are Nokias). Only 58% of iPad users are in the U.S. The next biggest countries are Japan (5%), UK (4%), China(4%), and Canada (3%). Android is less international, with 66% of users in the U.S. But the No. 2 country for Android is China (13%), followed by the UK (4%). 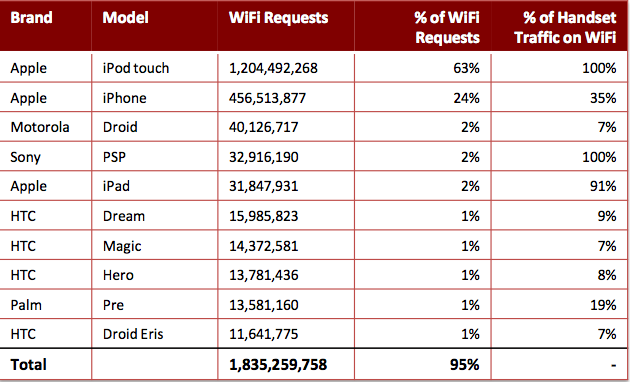 HTC and Motorola phones account for 83% of Android usage. Twice as many iPhone users download paid apps as Android users.